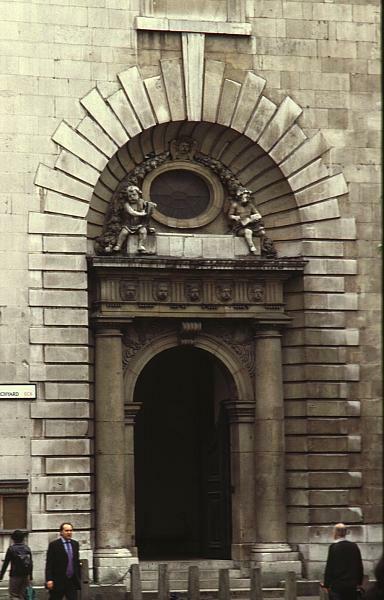 Eighty-seven parish church were destroyed in the Great Fire of 1666; this church, like most of Wren's churches, was rebuilt after the conflagration. 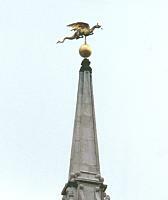 It was one of his most costly city churches with almost half of the total spent on the magnificent steeple. 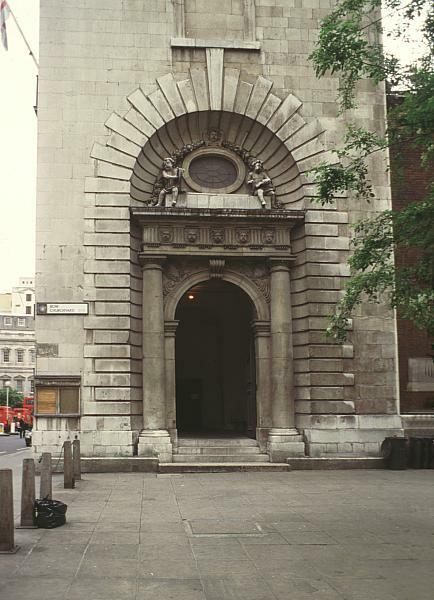 The name derives from the arches or "bows" on the vaulting of the 11th century crypt. 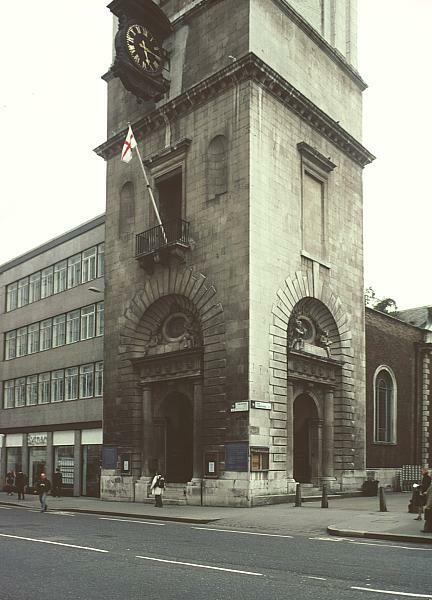 It is famous as the home of the "Bow Bells," the twelve bells in the belltower, "said to define as Cockneys those born within their sound. . . .The bells are significant not just to Cockneys, but also because the BBC used a recording of them during broadcasts to occupied Europe in the Second World War" (Humphrey 44). 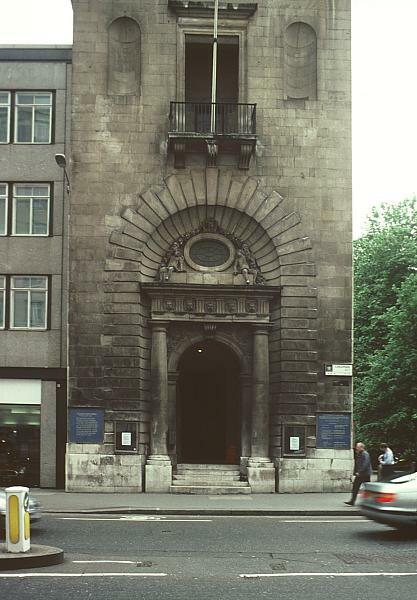 Today the church is the postwar Chair for the Bishop of London. The interior was totally remodelled after bombing in World War II, changing the pale white and gold of the original to unWren-like prettiness. The tower stands north of the body of the church, to which it is connected by a vestibule. The church proper, three bays wide with a barrel-vaulted interior, is in red brick. The lowest story of the belltower is square with an impressive door on each of the two outer faces. Each is set in a niche emphasized by channelled vousoirs, flanked by Doric columns, and topped with an entablature on which sit two carved children. 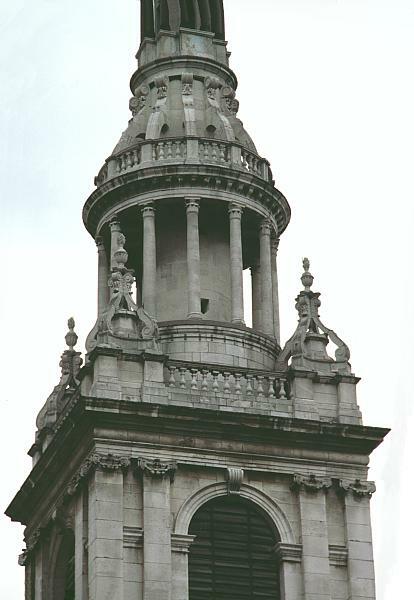 The belfrey has round-headed windows on each side and Ionic pilasters emphasizing the corners. 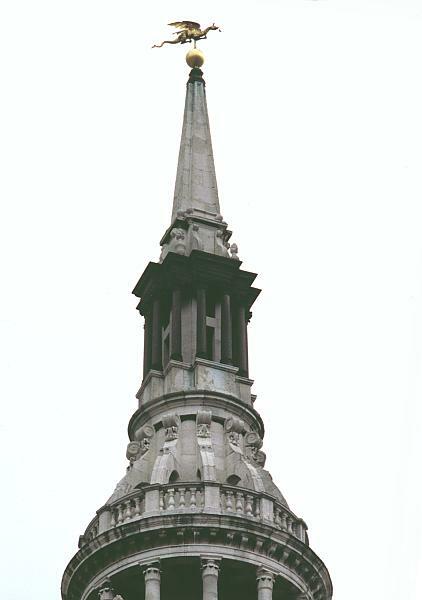 A balustrade tops the square tower providing a transition to the round steeple. 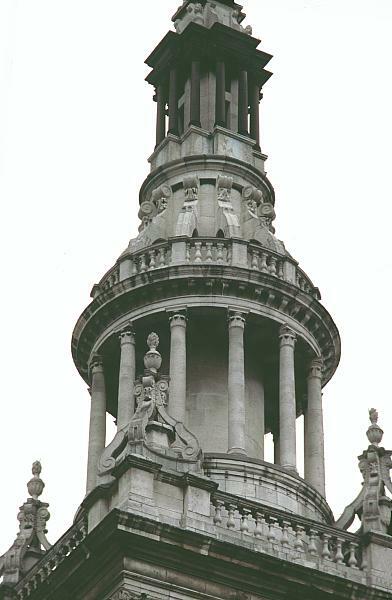 The corners of the tower have elaborate scrolls, topped by urns, which also lead the eye upward. 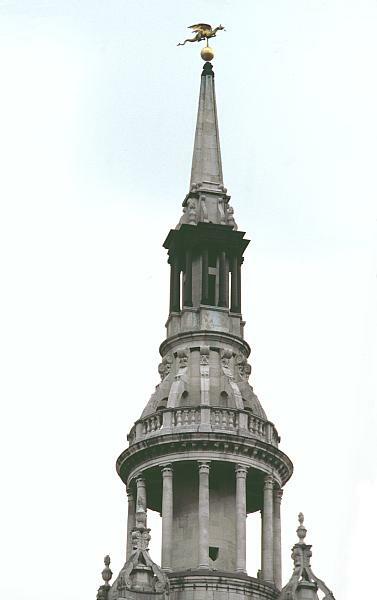 The square tower is topped by a round tempietto with a colonnade, then twelve reversed consoles around a circular core (Wren's invention of the "bows" which gave the church its name). Then there is a second square tempietto with small Corinthian columns, more consoles and the obelisk. 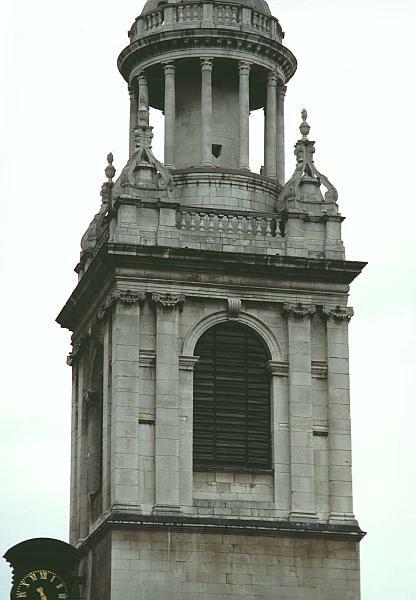 The bell tower is the tallest designed by Wren. It is 230 feet (70 metres) tall. 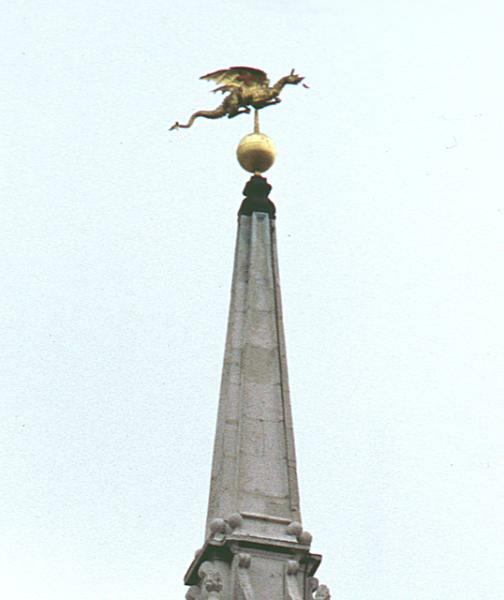 The dragon weather vane at the top is 9 feet long (2.7 metres). The interior construction of the bell tower is also complex. See Index for additional works by Wren. Stephen Humphrey. Churches and Cathedrals of London. New York: Contemporary Books (a division of McGraw-Hill), 2000.